The Manor Dutch Barn is bringing the simplicity of country life to your back yard. This barn has a classic look but down home country quality. 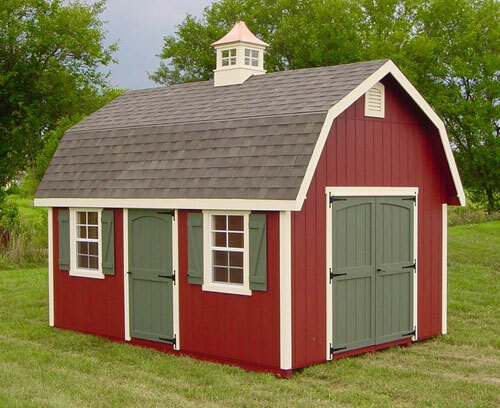 The sizes are 8′, 10′, and 12′ widths the length of the barn is 10′ to 24′ (shown at Plants and Things USA are 10′ x 12′, 12′ x 16′). Standard features are 7’4″ side walls (nice for lofting) 16″ OC construction, painted, pressure treated floor, 10″ antique hinges, architectural shingles, windows, vents and extra thick trim. Oh yeah! Shutters too. Come check out our store, you are invited, we’ll leave the gates open for you.